The local weather bureau report that the super typhoon "Soudelor" is expected to enter the Philippine area of responsibility on Wednesday. It could be the world strongest storm of the year 2015. PAGASA said, Super Typhoon Soudelor has maximum sustained winds of 210 kilometers per hour and gustiness of up to 245 kilometers per hour. 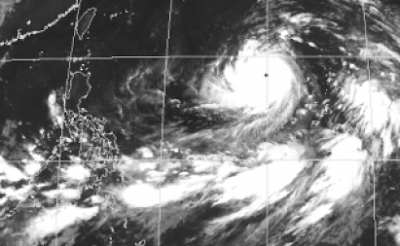 If ever Super Typhoon Soudelor enters the PAR on Wednesday, it will be named "Hanna." PAGASA weather forecaster Gladys Saludes said, "Sa ngayon kasi nakikita natin posible pa siyang lumakas at maging super typhoon." But the super typhoon is not expected to make landfall or directly affect the Philippine landmass, but it may draw in the southwest monsoon or habagat, which will bring rain over parts of Visayas and Mindanao starting Wednesday. She added, Super Typhoon Soudelor may stay within the PAR until Friday evening or Saturday morning. PAGASA said, At 10:00 AM Today, "the eye of TYPHOON “SOUDELOR” (INTERNATIONAL NAME) was located based on all available data at 1,855 Km EAST OF LUZON." Comments or suggestions about "PAGASA: Super Typhoon Soudelor to enter PAR on Wednesday" is important to us, you may share it by using the comment box below.